Dan Yaccarino has brought his unique sensibilities to designing the characters of the hit preschool series, The Backyardigans. Pablo, Tyrone, Uniqua, Austin and Tasha explore their imaginary world without ever leaving their backyards, which can suddenly turn into pirate ships, distant planets, or desert dunes. Music and imagination is what The Backyardigans is all about. And best of all, they always get home just in time for a snack! Dan Yaccarino is the creator and producer of the whimsically surreal world of Oswald, everyone’s favorite blue octopus. Along with his faithful hot dog, Weenie, Oswald embarks on fanciful adventures to discover just what life's all about. He has a quirky yet loving array of friends, including a finicky penguin named Henry and an energetic flower named Daisy. They all live together in the bustling metropolis of Big City where wind-up cars and lemon taxis zip down the streets, high-rise igloos rub shoulders with giant gumball machines, and paper airplanes zoom through the sky. “I wanted to tell simple stories about gentle characters in a world that was both strange and beautiful,” said Yaccarino. Featuring the voices of Fred Savage, David Lander and Laraine Newman, Oswald is enjoyed the world over. The show received a recommendation from the prestigious Parent’s Choice and was chosen by Time magazine as one of the top 6 shows to watch on cable. Now on Nick Jr! Check your local listings. What kid hasn’t brought home a stray dog, baby bird or firefly in a jar? Willa, that’s who! 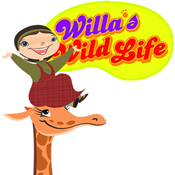 So far, this critter collector has adopted a giraffe, a couple of elephants, an alligator and so many other exotic animals, there’s barely room in Willa’s house for Willa! Dan Yaccarino is the creator and producer of this enchanting series (based on his hit picture book, An Octopus Followed Me Home) which follows the adventures of the indomitable Willa, who, like a young I Love Lucy, finds herself in comic predicaments that only seem to escalate as she fumbles through solutions. But thanks to her loving and patient father, and her entire extended family of zoo animals, Willa always manages to overcome her obstacles, learn a little something, and have a great time along the way. Now on NBC and Qubo! Check your local listings.